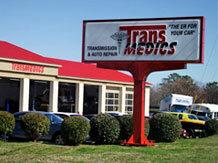 There’s a reason why we’re called TransMedics — after all, we are the ER for your car. It’s not just our name and our slogan; we take tremendous pride in being one of the premier sources of service and care for your car’s transmission in Raleigh and in the entire state of North Carolina. TransMedics, in addition to transmission maintenance and replacement, also provides transmission rebuilds for vehicle owners. Does your car have a manual or automatic transmission? It doesn’t matter — TransMedics and our team of Raleigh, NC mechanics can rebuild your transmission from the ground up quickly and with precision. So, your “check engine” light has turned on. What does it mean? Well, fortunately, an active light is not always indicative of a bad transmission. It could signify an issue with the engine itself, or another system or part, such as the catalytic converter. To receive confirmation, head over to our auto shop in Raleigh located near the corner of East Millbrook and Old Wake Forest. There you can receive a free diagnostic check to discover if any issue with your car’s transmission exists. If more intensive diagnostics are needed, our transmission specialists will quote you a price before we proceed further. Honda Transmission? Dodge Transmission? We Can Rebuild Them All! Our car specialists are often asked, “Is it better to rebuild or replace my transmission?” Our answer? We have found over the years that, because transmissions are calibrated to your individual car’s own computer system, it’s often better to rebuild the transmission to ensure it works perfectly in sync with your automatic or manual transmission. To talk to one of our mechanics, contact us and come on in for a diagnostic. We proudly serve customers from Raleigh, Wake Forest, Rolesville, Knightdale, Durham, Cary and beyond!